Paul Funk is one of the experts at the 2007 Propane Technology Forum who has taken all the talk about innovative propane research a step further. 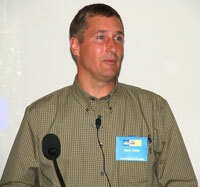 Paul is a scientist with the USDA-Southwestern Cotton Ginning Research Laboratory. He is among the first to put heat defoliation of cotton with propane into practice. Paul and I discussed what he’s encountered out in the field.